Just Jingle: Stampendous! and Clear Scraps Together? SURE! Now, onto the fun for today! Stampendous! 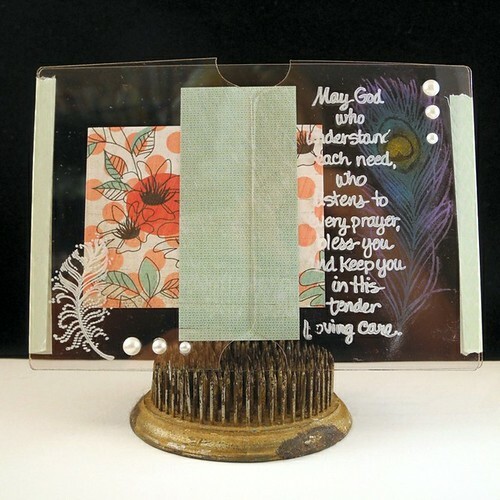 and Clear Scraps have come together for an awesome collaboration! Today I have a fun card to share with you and on Saturday we will have a BIG blog hop and I have an album to share with you then! LOTS of fun stuff!!!! For my card I stamped the Peacock Feather image in VersaMark and then chalked the image in a variety of colors. I was surprised at how well this worked on the acrylic! On the front of the card, I stamped the sentiment and the Feather Points image on the front of the card with StazOn Opaque White. HUGE thanks to Tsukineko for providing the inks for this project! They are fabulous! I love how stamping on the different layers creates depth on the card! So fun! I attached the front pieces to the back with washi tape and added a few pearls to embellish! 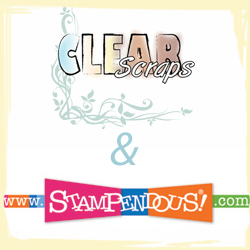 Now, be sure to leave a comment because Stampendous! and Clear Scraps have GREAT prizes for you! Comment on the Blog Hop! Saturday will be our big Blog Hop - comment on the blogs and we'll enter you once for each comment! Here are the other links to visit today! This is awesome! I love the layering of the images...such a cool effect. The peacock feathers are beautiful! this is too cool! love the peacock feathers! awesome layers. i love the card, great colors. I'm never ever going to get tired of peacock feathers. Simply gorgeous - the chalking is really superb, and I never would have thought to try it on acrylic! love how you chalked the feather! Beautiful job, Jen! Ooh, now that is cool. This turned out way cool! I always love anything with acrylic :) off to votey vote!! The peacock feather turned out great, very cool techniques here! 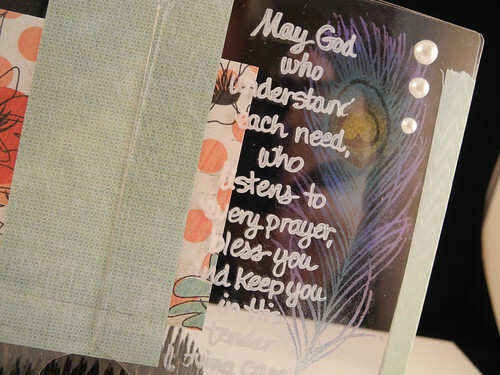 wow amazing card, love how you stamped on the acrylic! A transparent card, awesome idea, very unique...PS, LOVE your card holder pick too. Wow--just beautiful! Love the chalked feather--amazing! Very pretty--I like how you used the washi tape. 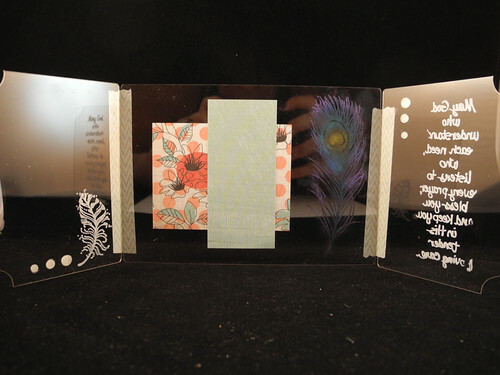 Gorgeous card and a beautiful mini - love the stamping on acetate and the verse is fantastic. Love the peacock feathers! Pretty! Fantastic job, Jingle! Love the way you've added elements to this card! Love that chalked peacock feather! So subtle and sublime! BTW, wishing you the best of luck for tomorrow. Crossing all my fingers and toes! Lovely project! Love that gorgeous peacock feather image! Sweet peacock feather and cool design! Good luck tomorrow! ooo I love the washi tape closure and seam ..it looks so trendy industrial and WAY cool!! well the ink on acrylic is cool too but the tape is unique man!! LOVE LOVE LOVE it! I have never worked with acrylic and I have to say this week is blowing my mind. This project is beautiful, and so many of the blogs I have visited have had great ideas as well. I have to try this out now! Hope I win some goodies to play with! Thanks for participating. OK. You have to share how you chalked the peacock feather! I need a tutorial (front or back? How did you just adhere to the stamped image and not smudge it? Did you put something over it to keep it intact--preservative?) So cool! Very beautiful and love the details! Love your card and have been one of your followers for awhile now. Great tips today, and so enjoyed it!